It’s one thing when the Daily News readers vote you the San Fernando Valley’s best Optometrist for the last six years. It is something altogether different when patients take time out of their busy day to sit down and write a handwritten letter of thanks to you. It’s all part of what makes Dr. Leonard’s team the best Optometrist in the valley. But, that happens all the time with the patient’s of Dr. Barry Leonard. Dr. Leonard's valley optometry office is overflowing with letters of thanks from his happy patients. The first time you come visit Dr. Leonard, you will notice the walls are lined with letters, greeting cards, and even little notes, all expressing their thanks for their restored vision and the exceptional care that they received at this seemingly “normal” Optometrist’s office. Dr. Barry Leonard CARES about their vision, and has allowed them to see clearly, maybe for the very first time in their lives. And that is why so many people call him the Best Optometrist in the Valley. 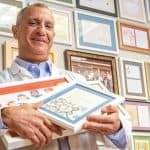 On this page, you will find just a of the many cards and letters Dr. Leonard has received over the last few years. You can only imagine how many more there are after being an eye doctor for over 30 years. So, is Dr. Barry Leonard the best eye doctor in the Valley? Lucky for you, that is something you can easily find out for yourself. Make an appointment today by calling us now or using our online reservation link on this and every page. From the moment you walk through the door, you will realize that there is something different here–a different level of care–that you never had before. We look forward to seeing you or your child in our office soon. Make your first optometry appointment now with Dr. Leonard at 818-891-6711. Or use our online appointment system that you’ll find at the top of this and every page. We look forward to seeing you soon, and to your discovering why everyone thinks Dr. Leonard is the best Optometrist in the valley.